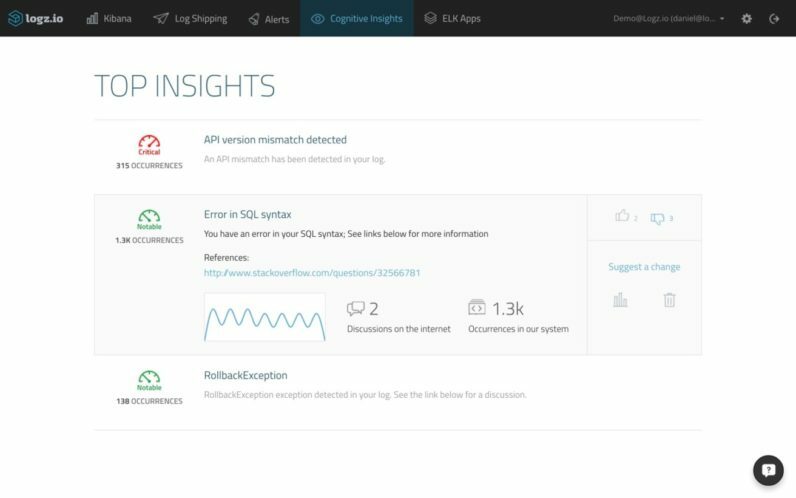 Developers can’t be everywhere, but a new service from Logz.io named Cognitive Insights can — and it might keep developers from wasting valuable time on Stack Overflow. Currently, development teams have to search for fixes to their problems on the internet when they’re stumped. It’s a lot of hacking at a keyboard for the right SEO phrasing, and then a ton of time trying to work what they’ve found online into their workflow. And a lot of hoping it actually works. Cognitive Insights does the work for them; it knows what technologies a team is working on — and what languages they’re writing code in — based on information users feed to it. From there, it proactively searches the internet for topics relating to what a team is working on. It uses machine learning to understand issues that are similar to what may be happening in your own apps or services, and monitors similarities in how problems are solved. UMI crawls thousands of data sources and discussion forums, ingesting millions of messages every single day to come up with the most common patterns of interesting log events. Additionally, UMI learns the way users interact with the results provided in order to offer the most relevant information to the unique circumstances. Cognitive Insights doesn’t solve issues for teams, but it dramatically cuts down on the time they spend looking for solutions. Rather than search the Web, you can peek into Cognitive Insights for a distilled list of topical issues.